Some time ago I read and reviewed Tim Butcher’s Blood River, about his journey along the Congo River, and I’m afraid to say I wasn’t terribly complementary about it. I didn’t like his style or attitude, and thought I would rather find other books on Africa. Yet when I learnt about his recent book, Chasing The Devil: The Search for Africa’s Fighting Spirit, I found myself keen to give it a go. Perhaps it was the African journey again which drew me in, but I have to admit there was also a hope that I might enjoy Butcher’s writing more second time round. Chasing The Devil is Butcher’s account of a journey across Sierra Leone and Liberia. Like Blood River, he is again recreating an earlier journey, this time the trip made by author Graham Greene and his cousin Barbara in 1935. As a war correspondent, Butcher spent time in both countries, and had a death threat against him in Liberia. He decided to return and get to know the countries better, and see how they were faring in peacetime. Butcher travelled through Sierra Leone by road, and then walked across Liberia (and a small section of Guinea, just as the Greenes had done) along with David, the son of an old friend. With the pair are Johnson, their guide, and Mr Omaru, who carries their luggage by motorbike. Sierra Leone and Liberia are countries of which my knowledge is embarrassingly little, so in addition to hoping to enjoy Butcher’s journey, I was hoping to learn something too. In this respect Chasing The Devil was certainly successful: in addition to sharing his own experiences of both countries in war, he had clearly done his research as the book is full of history and culture. Butcher writes these sections well, with a clear and easy to follow narrative yet not making it simplistic. Not only does he cover the two countries wider history and culture, but he focuses on smaller or more personal aspects of it as well, the account of what happened to the best hotel in Freetown being a good example. Yet while the history included in Chasing The Devil is interesting, as a travel book (albeit one with a more unusual destination than most) the key element is the journey and the author’s account of it. It was this side of things which had bothered me about Blood River, so I was uncertain of what to expect from Chasing The Devil. Good news though – I really enjoyed it. I didn’t find Butcher’s attitude off-putting as in Blood River, and I found him to be a good narrator of his experiences, enabling me to picture the places he was visiting. 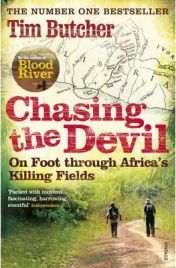 There is no major change that I can put my finger on in Chasing The Devil: perhaps it is because this seems to have been a more personal journey for Butcher, given his wartime experiences in Sierra Leone and Liberia, and those of his colleagues, or perhaps it is because he is following in the footsteps of an author rather than an explorer (Sir Henry Morton Stanley, whose 1874-1877 journey Butcher retraced in Blood River). Or perhaps I simply took entirely the wrong view of Blood River – maybe I should give it another go. The journey through Sierra Leone and Liberia was not packed full of excitement or danger, but there were some sinister threats which hung over Butcher and his travelling companions. There are secret initiation rites in both countries, known generally as the Poro, which outsiders are never supposed to witness or even know of. The group would have been in great danger had they stumbled across a Poro in the forest, or learnt too much. Additionally, there are hunters in the forests known as “heartmen” who take the hearts of their victims. With these threats hanging over them, there was often an element of tension to the book, as you felt that this danger could be waiting behind the next tree for the group. In addition to covering his own journey and the history of the region, Butcher also writes quite a bit about the Greenes. He covers the experiences of their journey, which he is aiming to replicate as closely as possible, and also other aspects of Graham Greene’s life. Having never read anything by Greene, this didn’t mean as much to me as it might to a fan of the author, but having read about the journey he undertook, I am interested in reading not only his account of it (Journey Without Maps) but also some of his fiction. So perhaps I was wrong about Blood River – or perhaps not, and Butcher’s second book is simply better than the first. Either way, I am glad I decided to give him another try, for whatever reason – Chasing The Devil is an enjoyable and truly interesting read, and recommended to all travel fans or those with an interest in Africa. Many thanks to Chatto & Windus (Random House) for providing a review copy of Chasing The Devil. 2 Comments on "Chasing The Devil"
As the author, I was glad the reviewer has identified an improvement between my first book, Blood River, and this, my second book. My deliberate device is to use my own journey purely as a hook, a way of drawing the reader into the much more interesting journey of a place and people, in this case the turbulent nations of Sierra Leone and Liberia. I am delighted this seemed to work well for this reviewer. Thanks for your comment Tim – I’m looking forward to reading about your next trip!